>The poor ZBT returns from the 1930’s represent a market environment from a long-ago era that may not be applicable today and therefore those results should be discounted. Behavioral economics tells us that our Confirmation Bias will have us choosing the outcome we expect from a range of possibilities. So for the ZBT we have it possibly going up and up or making a second low before going up and up. Our personal choice of which we take is our personal bias. How do we overcome our biases to do better? My suggestion is to set up an objective action strategy. Let me brainstorm this as an example (just that not one I use). Let’s say one commits to buying one third of one’s trading position when a ZBT arrives. Then add another third if market retraces half the gain from the low. If the market then turns up from this minor pullback and makes a higher high from you first purchase level buy the last third. If the market doesn’t turn up but makes a double bottom , buy then with your last third. That is an example of an investor that is bearish and hesitating to buy in after markets have rallied. The objective strategy gets them in to some degree with any future outcome. How about an investor with an bullish bias? They might go all-in with all their chips when a ZBT arrives but have a ten day moving average exit/rebuy strategy with half (or more) of their investment. All this to say, an objective strategy will help overcome one’s biases. Customize it to suit your thinking. So, market was around 2632, on 11-26-2018 and circa 11-19-2017. We are now at the same point now, give or take. Someone who bought the market on 11-26-2018 or on 11-19-2017, bought it with no ZBT signal. None of these constitute long term buy signals. Sure, as trading signals, these would likely work, as Cam has show elegantly. That said, our focus should be on earnings per share of S&P 500 and monetary policy, market valuation, geopolitical risks and corporate debt (this may be Black Swan event, this time), trade war, consumer confidence, all linked to each other. The question remains here is whether we are going to open the next trap door down, here, at 2634 (50 dma) on the S&P 500. 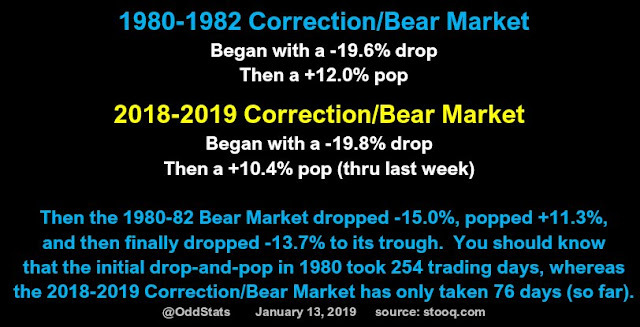 Bear markets are painful affairs, and for now, there has not been enough pain. The metric of pain, can be in Vix level, put to call ratios, bull bear ratios or CNN fear and greed index, but more importantly time. 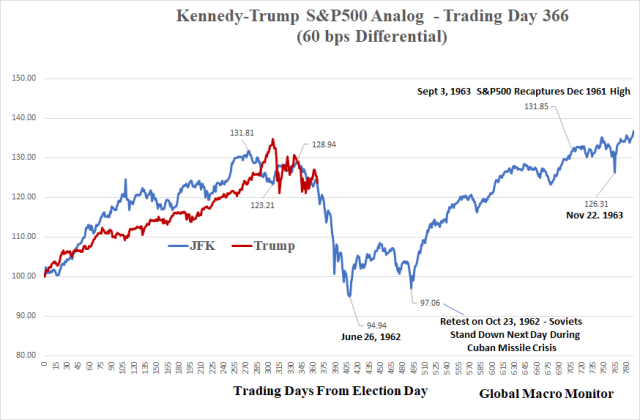 So, how does the average Joe feel, if come 11/2019 and 11/2020, market is at 1550 (50% loss from the peak of 2018)? Would we see 1550 (this number is also the peak of 2000 and 2007 bull markets)? Well, Cam has pointed out Fibonacci retracement of 33% to 2100. If we were to see 2100, emotional selling could well take us down much below 2100. As an investor, that is what I am trying to understand at this juncture. ZBT could be good for trading, however None of the issues that you have mentioned have been squared away. Hence my hesitation on actually believing this bounce. All of the things that really matter, i.e. Earnings, valuation, corporate debt, trade war, Brexit, consumer confidence (which is most surely taking a hit with the shutdown), have not been resolved. 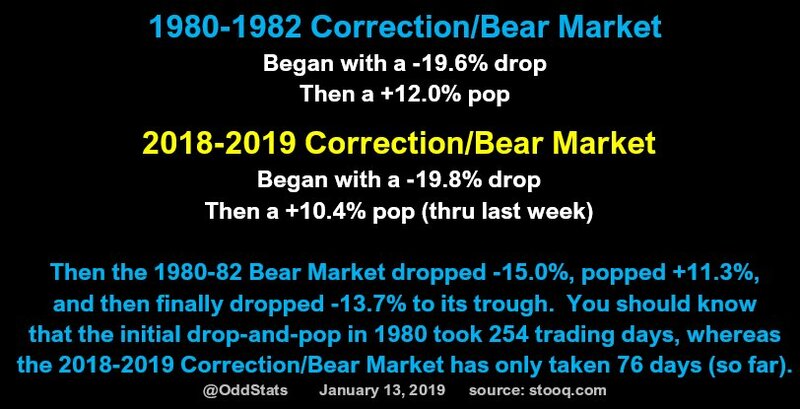 I agree with your sentiments, and do believe that “the Pain” has not been felt by the weak hands and they have not capitulated, yet for me to think about a bear market bottom. I am in a wait and see pattern. Thanks again for your contribution to this blog over the last few years. Stocks returned on an average 17.7%, PER ANNUM from 1980-2000. From 2000-2018, the return has been only 5.6% per annum. Before getting too comfortable with stocks, think again, if you are getting adequate risk adjusted returns in stocks or not. Class A Illinois farmland has appreciated from 3000$ to 12k give or take (8% annualized return), in the same time. Physical gold (bullion) has risen from 265$ to 1290$ in the time frame (9% annualized return). Understand that Illinois farmland has lost roughly 30% or so value from its peak (my returns are after taking this loss, at current prices). Same for gold, which has lost roughly 30% from its peak. Again, my returns on gold are after the loss, on current prices. The question is will current stock prices return historic 8-10% returns in the next decade? If they do, next decade should see massive annualized gains, so that there is a return to mean. If stock prices are random, it is possible that S&P 500, could yield an annualized over 10% return over the next 1-2 decades, so that there is mean reversion to 8-10%. Stocks have created returns with significant volatility, as compared to a widely diversified asset portfolio. For my money, I like to cut risk, as rewards are nebulous. I have done well in the last two decades by limiting exposure to stocks. Academics will tell you otherwise, but 5.6% annualized returns are way sub par, for the risk one would incur on capital. By comparison, a 20 year US treasury bond in 2000 was close to 7% annual yield. It is important to measure investment horizons over years and decades, not in months and quarters. Last quarter of 2018 was an anomaly in that respect. Thanks for the extra clarifications. Cam, this has been a great call. Thank you. The sentiment – at least based on market chatter – seems to have reversed quite a bit. Is it time to close some longs in the trading account?